Fairy Land slot machine is a remake of the most famous slot machine of the same name. There are five reels, 9 playing lines, risk game, as well as bonus game, allowing to win an average of about 6 total bet. Standard payout table for a match per line is shown at the bottom of the page. In our proposed version of the game, an additional frog symbol is added on each of five reels. This innovation has increased bonus game frequency 7 times with respect to the original Fairy Land slot machine! Super bonus game with 50% chance to win with super prize of up to 70 total bet. Also, mathematics of our slot machine ensures that the frog is by one of the two sides providing win in super bonus game. FAIRY LAND slot machine developed in 2012, as well as all games offered by us, has fair play control that guarantees constant slot rate of return. The five reels are similar and have 43 symbols. This section provides a layout of 43 reel symbols. Slot machine fair play control system applies to the lines, gambling game, bonus game and super bonus game. For details, see Slot Machine Fair Play Control. Fair play control for “Water Lilies” bonus game and “Search for a Frog” super bonus game has its minor features, which can be found below. Brief rules and payout table is always available when pressing HELP button of FAIRY LAND window. In the main game, before a spin, you can select the number of playing lines by pressing LINE 1 ... LINE 9. Bet per line from 1 to 25 credits can be changed by pressing BET. The cost of 1 credit equals to 0.01 xBTC or 0.1 xBTC. You can spin the reels by pressing START. If any line where you have a bet, has three or more same symbols standing side by side, including outer reels, you win according to payout table available when pressing HELP in the game window (page 2, page 3). When playing slot machine for cash, autoplay function becomes available that is activated by an additional button (to the right of START button). In this mode, if there is no win in the main game, the reels make next spin automatically, while maintaining the same bets and number of lines. 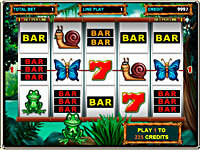 The website has a demo version of slot machine available without registration. This game is for familiarization with a new interface, so the way to open Super Bonus game is simplified. CHAMELEON is a wild symbol, it means that it can replace any of the symbols on the reels except FAIRY LAND symbol. In case where wild symbol on any line makes two combinations, the combination is paid with a greater win coefficient. If you wish, after payment in the main game, you can try to double your win. To do this, press DOUBLE. Four cards face down and one dealer’s card face up is shown to the player. By pressing LINE 3 ... LINE 9, the player has to open one of them. If the selected card has higher rank than the dealer’s card, win will be doubled and a new level of gambling will be offered to the player. If the player opens the card of the rank lower than the dealer’s, he loses his current win. Equality of cards means draw, and the player goes to the next level of gambling. This slot machine has NINE gambling levels. The player may abandon another attempt to double and take cash after the dealer’s card is shown face up. To abandon gambling, press START. On the 1st level, the player has 50% x 50% chance to double. On the 2nd level, chance to double is 40% to win, 50% to lose and 10% to draw. On the 3rd level, on the contrary, chance to double is 50% to win in favor of the player, 40% to lose and 10% to draw. Levels 4 and 5, 6 and 7, 8 and 9 are built similarly as levels 2 and 3. Read more about implementation of the above chances in Slot Machine Fair Play Control section on the example of CRAZY MONKEY slot machine. Water Lilies bonus game appears randomly, like other win combinations. Bonus game requires that three or more frog symbols appear on the entire screen (on any of the fifteen visible symbols of all 5 reels). Wild symbol can not be considered as frog symbol and does not affect the appearance of bonus game. Bonus game starts automatically; if in this case win combinations appeared on playing lines, they are paid after the end of bonus game. In Water Lilies bonus game, the player shall by controlling the frog, leap to the last row of lilies, and not be eaten by a crocodile. Only one LINE 5 button is provided to control the frog. By pressing it at the right time, you can adjust the direction of the next leap. For leaping over each lily, the player gets credits. If the frog meets a crocodile, bonus game ends and all credits won are multiplied by total bet and added to total credit of the player after returning to the main game. Super Bonus game starts in case a player managed to complete bonus game without meeting a crocodile. The purpose of super bonus game is to guess which side is the frog and get a prize with amount randomly varying from 10 to 70 of total bet. If a player has lit a hidden crocodile, super bonus game ends. To light a flashlight at the right time use LINE 5 button. All credits got in bonus and super bonus games are multiplied by total bet and are added to total credit of the player after returning to the main game. Twenty numbers after Bonus word (Bonus=2,1,0,5,9,1,4,8,3,5,5,1,0,7,3,6,8,1,9,3), determine the outcome of bonus game. These numbers are generated independently of each other, and can take values from 0 to 9. Each of these numbers determines the prize under the water lily from left to right and from bottom to top, showing the number of credits earned (See the correspondence table below). Numbers 0, 1, 2, 3, in the table corresponds to a value of 0 – which means that a crocodile is under the water lily, and if a frog leaps to this water lily, bonus game ends. The remaining values from 4 to 9 correspond to prize coefficient by which Total bet is multiplied. Super bonus game fair play control is similar to Crazy Monkey slot machine. A part of initial line SuperBonus=9,4 determines the super prize. Left number is a prize when lighting the left place with a flashlight, right number is for the right place. See the prizes corresponding to the numbers in the table. At any stage of bonus games there is an option to set value offset determining the prize, leading to win of a prize not set by the software.